As of Friday November 16, 2018, California was home to the three most polluted cities in the world. These three cities – San Francisco, Stockton, and Sacramento – topped the world’s chart of polluted cities as a result of the infiltrating smoke produced from the nearby, devastating Camp Fire. To date, the Camp Fire is the deadliest fire in California history and has burned over 170,000 acres of land, roughly the size of New York City. 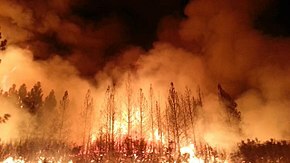 Over its rampage it has destroyed immense areas of California’s wildlife and burned down over 17,000 man-made structures. Unfortunately, the Camp Fire’s destruction isn’t limited to the destruction inflicted by its flames. This mass burning of a variety of natural and man-made sources has resulted in smoke containing a myriad of small particles that can be hazardous when inhaled. Thus, the smoke produced from the Camp Fire, which is spreading over 150 miles away from the fire and polluting the air of California, is a matter of great health importance. The link between adverse health effects due to smoke produced from forest fires and those due to emissions produced from other sources such as diesel engines and industrial factories has long been established. Specifically, exposure to these air pollutants is linked with the onset of respiratory effects such as bronchitis, increased asthma attacks, elevated blood pressure, atherosclerosis, and, for more susceptible individuals, heart attack or stroke. Alveolar sac lined with capillary bed. 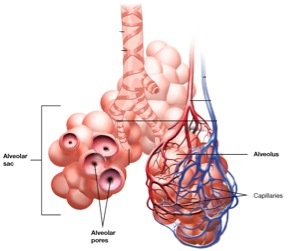 Anatomical view of Air Blood Barrier (ABB). These adverse health effects are largely driven from the small, ~1µm – 10µm in diameter, solid and liquid particles (PM) contained in smoke or emitted from a specific source. Due to these particle’s small size, they are able to travel throughout the lung after inhalation and negatively affect both the conducting and gas exchange regions of the lung. Once the particles have “landed” in a region of the lung, they can persist for days and begin to elicit a pro-inflammatory and oxidative stress response which can exacerbate asthma symptoms and damage integral components of the lung, leading to various respiratory effects.How these particles cause adverse cardiovascular effects is an active area of research. There are three proposed mechanisms: 1) particles smaller than 2.5µm in diameter travel through the lung, pass the alveolar blood barrier (ABB), and enter the bloodstream leading to direct vascular damage, 2) particles that reach the ABB, but do not pass, can induce oxidative stress in the underlying vasculature indirectly, and 3) particles can interfere with the autonomic and central nervous system leading to irregular signaling and irregular heart rate. Overall, while some of the mechanisms leading to the variety of adverse health effects induced by PM exposure are still unknown, it is clear that PM exposure can be detrimental. When forest fires are near it is extremely important to listen to the local official’s recommendations for staying safe – even if the flames are 100+ miles away! Thus, as the incidence of forest fires continues to rise, likely due to factors such as climate change, we need to be mindful of both the destruction the flames create and the hazardous air the fires can produce. Peer Edited by Rita Meganck and Jacob Pawlik.